I’m super excited for this!! Come and fill up the last remaining seats for this benefit dinner, demo and lecture. Denise Celdran and I will talk about the superpowers of herbs and spices, treating cancer treatment side effects with food, how to make the food you eat more cancer fighting. 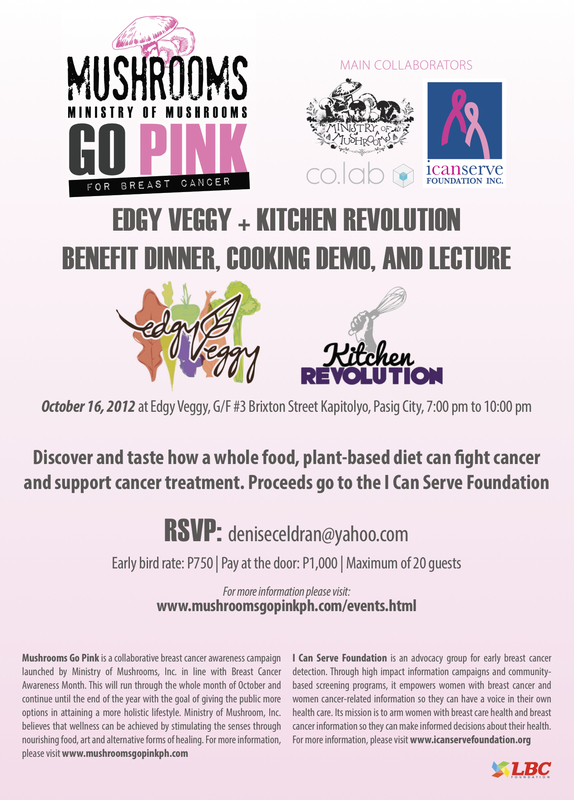 Mushroom man Marco Lobregat will share how mushrooms can be super beneficial for your health and for cancer treatment. By the way, this is informative for anyone interested in health and good food. Plus you get to eat the dishes (5 types) and take home the recipes! 7:30pm at Edgy Veggy Vegetarian Food‘s Cafe in Kapitolyo, Pasig in collaboration with Ministry of Mushrooms andICanServe Foundation, Inc.